Why do certain buildings / shops / locations become landmarks? Because they've been there, exactly there, for a generation or more? Because they provide a verbal shortcut for getting to somewhere nearby? Because you can happily take them for granted knowing that they'll most likely still be around in another 5/10/25 years? I put it to you that Ipswich landmarks would have to include a brace of bridges, (a) Orwell and (b) Ferodo, plus Martin & Newby (I know, I know), and maybe possibly arguably perhaps this week's venue: Jack's Cafe. Surely there's no other eatery from the 1958 Kelly's Directory of Ipswich and Neighbourhood that's still operating in 2009? That's longevity. 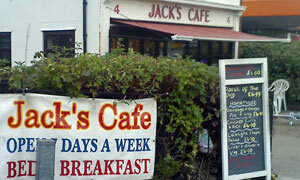 You must know Jack's. It's the caff that's marooned in a huge orange island of try-something-new at the bottom of London Road, acting as a surrogate West Gate for the town. Bike parking is provided by a lean-to wall, while round-the-back car parking is plentiful thanks to Senor Sainsbury. Through the hallowed front door we go, underneath that bold lettering and very deliberate apostrophe, and the interior goes back and back and back, like Al's Cafe. Like its (one-time?) relation, the Neptune, they don't bother with individual menus. Instead there's a series of vast boards offering all day breakfasts and full blown meals from the traditional (liver & bacon, sausage & onion pie) to the Anglo Italian (lasagne and chips). There's booze, too, if a Bud or Becks is your cup of tea. In homage to the inspirational EBCB -- not the Evangel Bible Church of Berkeley, but the fabulous eggbaconchipsandbeans, mine's the E,B,C&B with a choccy Yazoo on the side. An unverified sighting of Nesquik was claimed. Order at the counter then hold on tight to your raffle ticket. Plate arrived, squirt of sauce, food consumed, job done. At Jack's, a man can sport his tattoos and dwell on odd-numbered pages of the Daily Star while feasting on fried food. Cliche, of course, since the single blokes also shared the cafe with couples, children, you name them. All bonus areas ticked too with kids' meals, newspapers and free (!) WiFi, much like the Mega Byte, never mind the tournament play Indiana Jones pinball, fruit and ciggy machines. Too full for even a KitKat, I chose a milky coffee: no microwave needed here, as the lady used her un-little urn to top up a mug of milky Nescafe. Next time, I'll stick to the tea. Big banner out front talks of the £22 bed and breakfast, inc. satellite TV. Usually they'll accommodate you upstairs. If they're busy, it's down to the basement at Jack's. If it was a car -- Standard Vanguard. If they were passing by -- Jack Duckworth.